The post was seemingly deleted quickly after it went up, which leaves a few possibilities as to the reason. The most likely are that the post was inaccurate and Park took it down on his own, or otherwise that Hasbro saw this as an early leak and asked him to remove the post before it spread further. Regardless, we will have confirmation coming up at Power Morphicon, when the Beast Morphers cast and crew are revealed. Until then, stay tuned for any updates. What are your thoughts on this possible leak? Let’s discuss! How to get through the coming months without being fooled by fake news! Kamen Rider Zi-O has just been trademarked meaning that, for the next few months, news will be coming out all the time in the run up to the first episode. Of course, most it of this news will be real but we all know that fake news is far from uncommon in tokusatsu. These can be so convincing to the point that people may still believe it months after it was debunked. A lot of this “news” is just an occasional rumour on a forum or website, but sometimes a lot of effort is put into these fakes. You can sometimes see future episodes or even future seasons faked. With fabricated catalogues, episode listings and even trademarks becoming increasingly common, I’ve decided to compile a list of different methods to identify them. For plot details of future episodes, don’t expect news about episodes more than 6 weeks after the last episode to be true. Finally, expect about 90% of the information leaked between the new name trademark and the first quarter scans to be fake. A common thing you can expect is a “leaked” image of the new supposed Sentai Red. This has been happening since at least Go-Onger, and they have all been fake. The only real first image of the Sentai Red will be a still of an actor in the actual suit. You can expect this image to appear sometime before or at the same time as the first quarter scans. Inconsistent or missing information isn’t uncommon in fake Toku news. 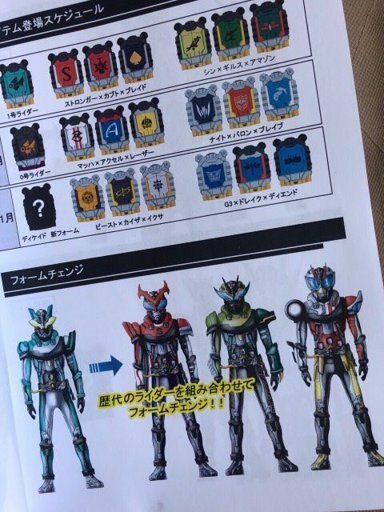 Take, for example, the fake catalogue scans from earlier this year depicting a supposed new Kamen Rider series (see featured image). Some of the pages had release dates while others didn’t. Another notable thing about those scans is that they weren’t actually scans, they were low-ish quality photographs taken in a way to exclude some information. This is common with fake scans across all different forms of media to make it appear like it was taken in a hurry. Most real information is scanned before it is leaked. The final key piece of evidence that this was fake was that the background was quite bland. Most catalogues are usually a bit more creative with the backgrounds. If you encounter a new name for a Toku series, double check the twitter account @trademark_bot to see if the name is there. While there is a chance that rumoured names are real, it’s not worth believing them if they haven’t been trademarked yet. These next few aren’t generally used for when forging Toku leaks, but I’ve often seen these in fake video game leaks so these may be helpful. Some images might be fan art passed of as scans. You can find out if these images appear on other websites by cropping out the part of the image you believe is fake and running it through a reverse photo search. Google has a built in reverse photo search function on its image page, but other websites dedicated to reverse photo searching exist, such as TinEye and Image Raider. Finally, the most important tip, trust your gut instinct. The human brain is amazing at detecting abnormalities in anything so if you think it’s fake, it almost certainly will be. What are your favourite ways to spot fake Tokusatsu leaks? Let us know in the comments! New Toy listings have come out detailing the last few Kamen Rider Bulid Toys. These were leaked by a 2chan user who has shared correct info before, however, it is worth taking this with a grain of salt anyway. Info- Transforms grease into his Final Form. To use, the cap is spun, and then inserted into the SclashDriver. 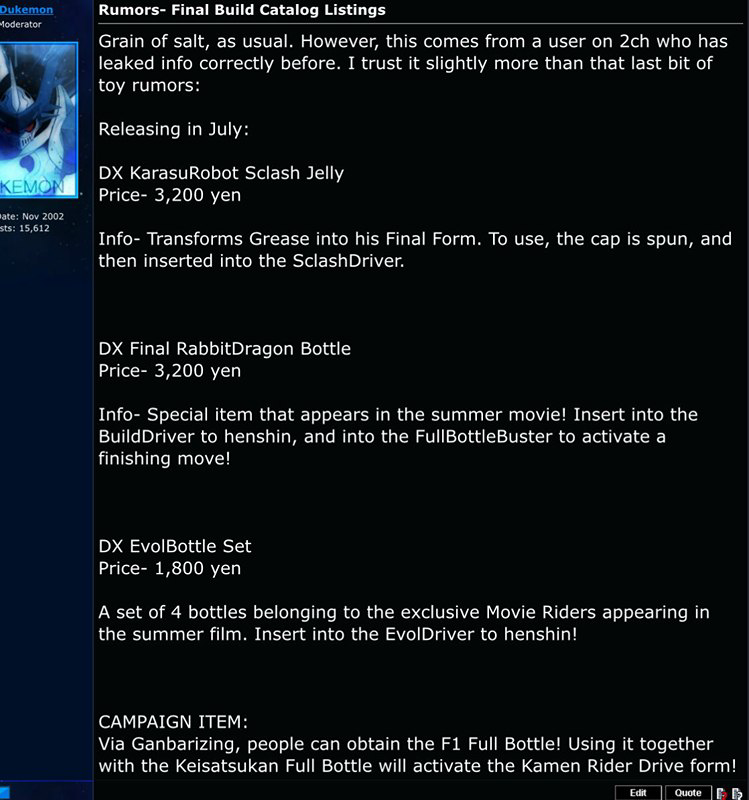 Info- Special item that appears in the summer movie! Insert into the driver to henshin, and into the FullBottleBuster to activate a finishing move! A set of 4 bottles belonging to the exclusive Movie Riders appearing in the summer film. Insert into the EvolDriver to henshin. All of these toys will be released in July. Will you be getting any of these toys? Let us know in the comments!